Growing up watching "Mid-Atlantic Championship Wrestling", the top singles title in our area was the United States Heavyweight Championship. From its inception in 1975 until the sale of the company to Ted Turner in 1988, the U.S. title was always the top prize and one of the key areas of focus for Jim Crockett Promotions. The roster of wrestlers who held that championship reads like a Who's Who in wrestling. Half of them are in the WWE Hall of Fame. Several of the former great champions who held that prestigious title will be appearing at this year's Mid-Atlantic Wrestling Legends Fanfest in Charlotte from August 4-7. They will be signing autographs and taking photos with fans over that long weekend. "No. 1" Paul Jones was a major player in the title's early history. After Johnny Valentine forfeited the title following the tragic plane crash in October 1975, Jones tore through the subsequent tournament to fill the vacant championship, losing to Terry Funk in the finals. But Jones rebounded three weeks later on Thanksgiving night to beat Funk in the rematch for the honors. Two additional weeks later Funk beat Jack Brisco for the NWA title in Florida, and all of that interwoven story led to big matches between Jones and Funk for the NWA title, too. Jones' main feud over the title, though, was with the rugged Blackjack Mulligan. The two Texans battled the entire year of 1976 over the championship, trading the title between each other several times. Magnum T.A. got his big break on a national level when he was brought in to the Mid-Atlantic area by booker Dusty Rhodes to fill the vacant spot left by Barry Windham when Windham left for the WWF in the fall of 1984. Magnum debuted right after Starrcade '84 and quickly shot to the top of the roster challenging Wahoo McDaniel for the U.S. title. When he defeated Wahoo in Charlotte for the belt in March of 1985, Magnum became a "made man", having survived a brutal series of matches with one of the areas legitimately tough opponents in the ring in McDaniel. The remainder of his run for Jim Crockett Promotions was centered around two memorable feuds over the U.S. title, first with Tully Blanchard which led to the memorable "I Quit" match at Starrcade '85. He followed that up with an 8-month feud with Nikita Koloff that culminated in the famous "Best of 7" series of matches for the U.S. title during and after the Great American Bash in the summer of 1986. Had Magnum not had the tragic automobile accident in 1986, he was destined to regain the U.S. title at Starrcade that year, and generally was thought to have been headed for a run as NWA world champion as well. Tully Blanchard may best be remembered in the Mid-Atlantic territory for his on-again off-again long running feud with Dusty Rhodes, but perhaps his most memorable singles feud and title run of that era was with Magnum T.A. over the U.S. championship in the second half of the year 1985. Tully, accompanied by his "Perfect 10" Baby Doll, defeated Magnum that summer in Charlotte, and put the title on a big national stage as Jim Crockett Promotions had taken over the TV time on the national cable network SuperStation WTBS in the months prior. Magnum chased the title the rest of the summer and all that fall, culminating in the memorable "I Quit" match mentioned earlier at Starrcade '86 Thanksgiving night in Greensboro. Tully never got the U.S. title belt back but went on to hold almost every other title in the area, including the National heavyweight title, a second run as TV champion, and most famously perhaps as Arn Anderson's partner for the NWA world tag team titles. It's also notable to point out that during the feud with Magnum over the U.S. title, Blanchard would join Ric Flair and Flair's cousins Ole and Arn Anderson, along with new manager James J. Dillon, to form the group that would be known as The Four Horsemen. Nikita Koloff took the wrestling industry by storm, and despite only being in the business two short years, had a remarkable series of matches with Magnum T.A. over the United States championship in 1986. It started early that year with several unsuccessful attempts to get the title resulting in Nikita showing his frustration by attacking Magnum with his feared Russian chain. But the real slow-burn build to their memorable matches began when uncle Ivan Koloff refused to let Nikita wrestle on TV until Magnum and Jim Crockett Promotions had agreed to the stipulations that Ivan even asserted had been signed off on by the Kremlin! Eventually, everyone came to terms, and the match was signed, but in the ensuing press conference where the contract signing took place, Nikita insulted Magnum's mother, which resulted in Magnum going nuts, later punching out the president of the NWA, and having the title stripped from him. This all culminated in the famous "Best of 7" series during the Great American Bash mentioned earlier. Nikita won the first three matches, but Magnum came back to tie the series 3-3 in dramatic fashion. Nikita eventually won the title in match #7 in Charlotte. The two were headed for a climatic rematch at Starrcade '86, but Magnum's tragic automobile accident ended that, and Nikita turned "good guy" paying his respects to the fallen Magnum and forming the "Super Powers" tag team with Dusty Rhodes. As a member of the second famous version of the Four Horsemen (with Ric Flair, Arn Anderson, and Tully Blanchard managed by James J. Dillon), Lex Luger defeated Nikita Koloff for the U.S. title at the Great American Bash event in Greensboro in the summer of 1987. His run as U.S. champion in the Crockett era culminated in the big cage match with Dusty Rhodes at Starrcade '87 in Chicago when he tried to use a steel chair on Rhodes, but it backfired and the American Dream took the U.S. title from him. It was ironically Dusty's first ever run as U.S. champion, coming near the end of his illustrious career, despite having been vying for the title since the early days of championship against Johnny Valentine. Luger went on to hold the WCW U.S. championship on several occasions. That WCW U.S. title was the linear descendant of the Crockett U.S. title. After this article was originally published comes word that "The Hammer" Greg Valentine will be making an appearance at the NWALegends.com Fanfest as well. Greg was a three-time U.S. title holder whose first reign as champion involved his infamous turn on his longtime tag team partner Ric Flair in 1980. After a successful stint in the WWWF, he returned to the Mid-Atlantic area in 1982 to renew his bitter rivalry with Wahoo McDaniel, winning the gold belt from Wahoo and then began a brutal feud with Roddy Piper over the title which culminated in their famous "dog collar" match at Starrcade '83. 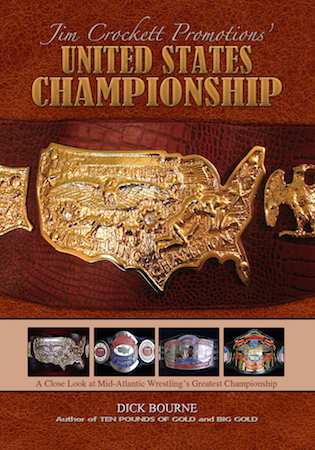 Greg was one of the few U.S. champs to wear three different versions of the U.S. title belt, all outlined and illustrated in our book on Jim Crockett's U.S. Heavyweight Championship. All of these great former champions will be appearing at the NWALegends.com Fanfest in Charlotte. The event takes place August 4-7 at the University Place Hilton in Charlotte, NC. Visit the Fanfest website or their social media pages for complete details on when these great wrestlers will be appearing during that big weekend. The Gateway Interview - Magnum T.A. Shawn Michaels on "The Ric Flair Show"
Gene Anderson Was No Help At All!